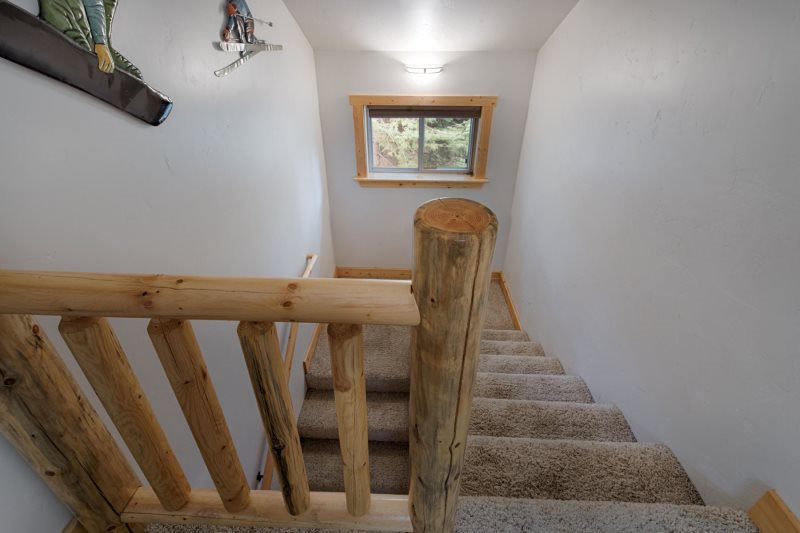 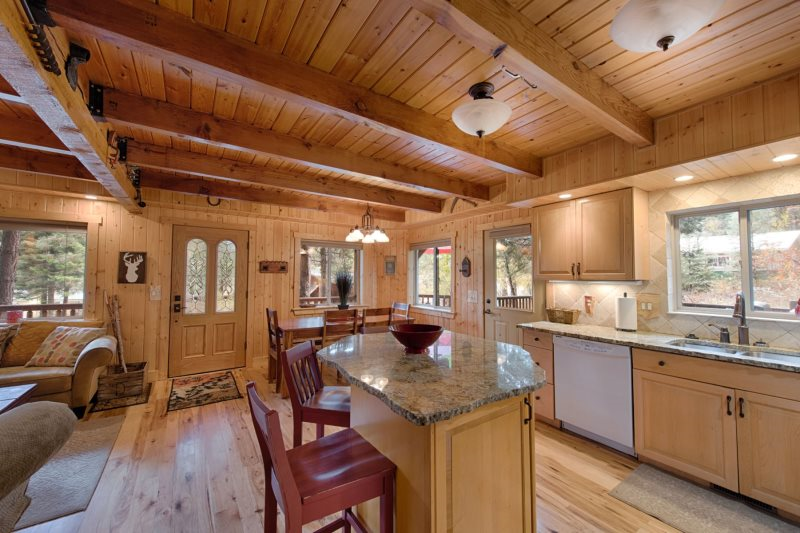 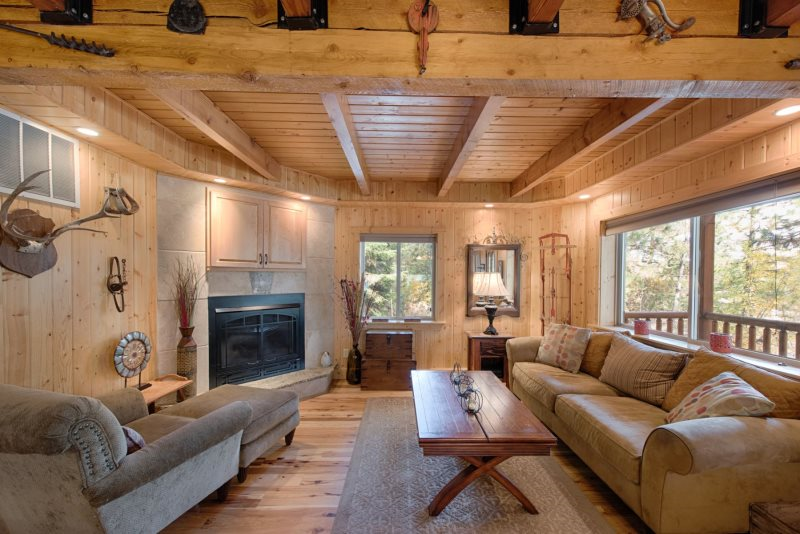 If you like the warmth of natural wood floor to ceiling, you’ll love The Knotty Pine. 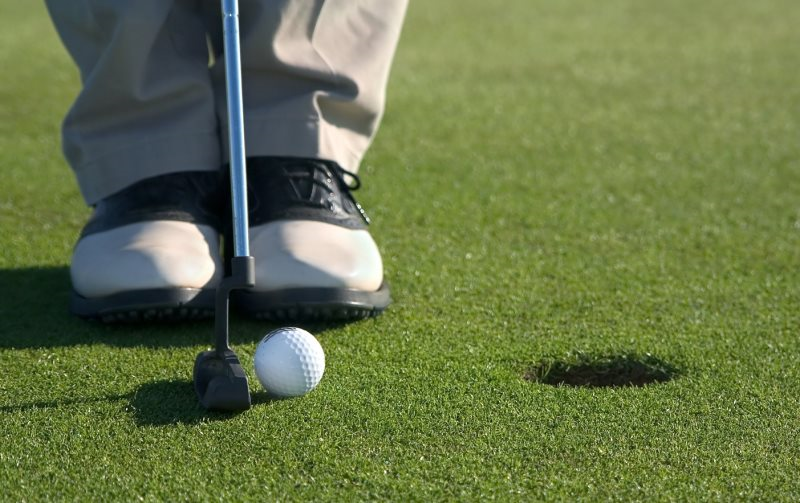 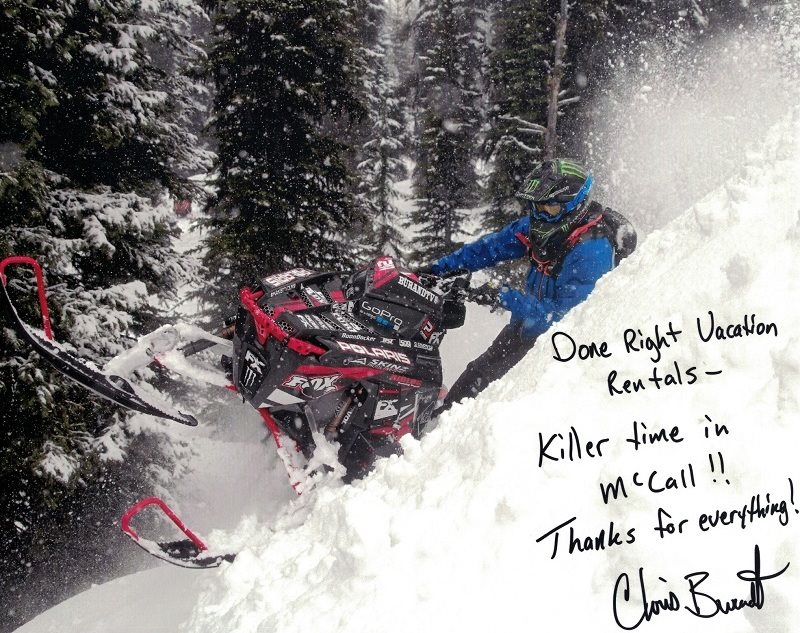 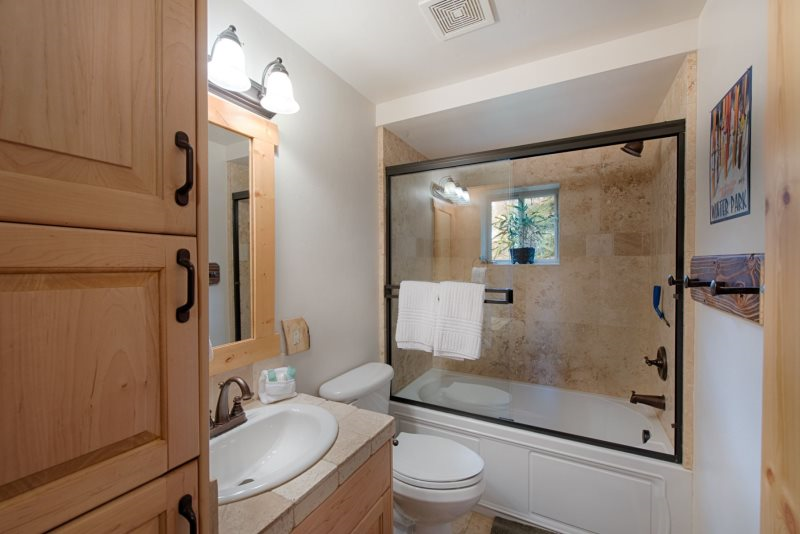 Make the most of the 2400 sq. 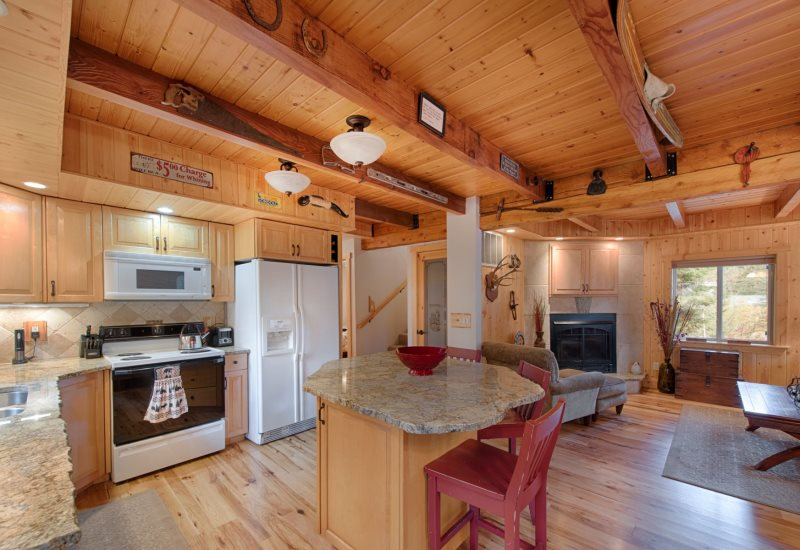 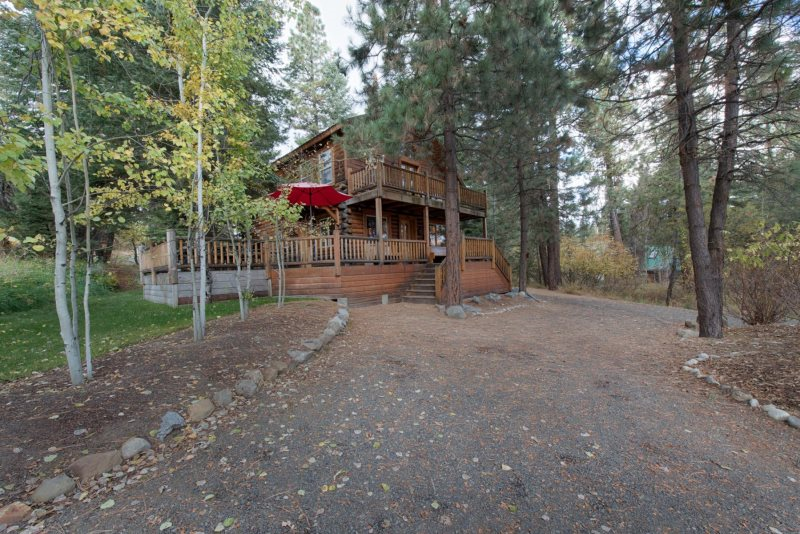 ft. of indoor and outdoor living space with lower and upper decks in this stunning, two level log home. 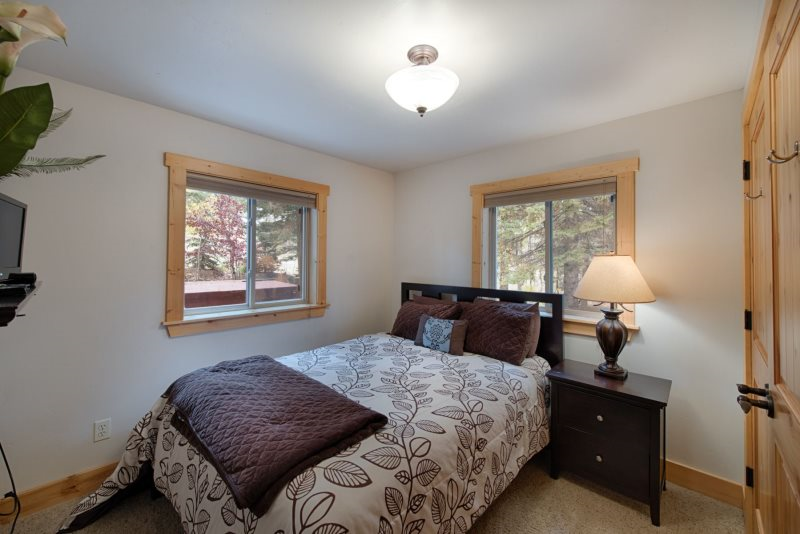 Lots of windows to let in the natural light and views of the established yard and trees surrounding the property. 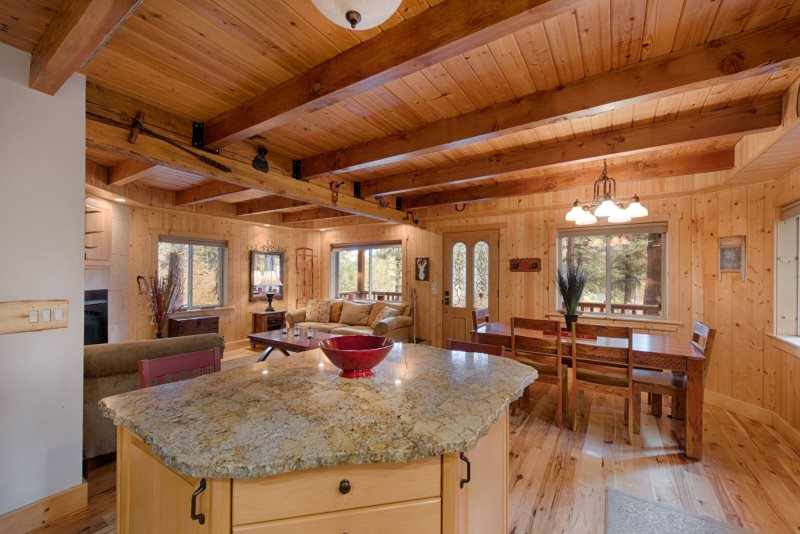 Well designed, open floor plan seamlessly blends living, dining and kitchen areas under a drop beam ceiling. 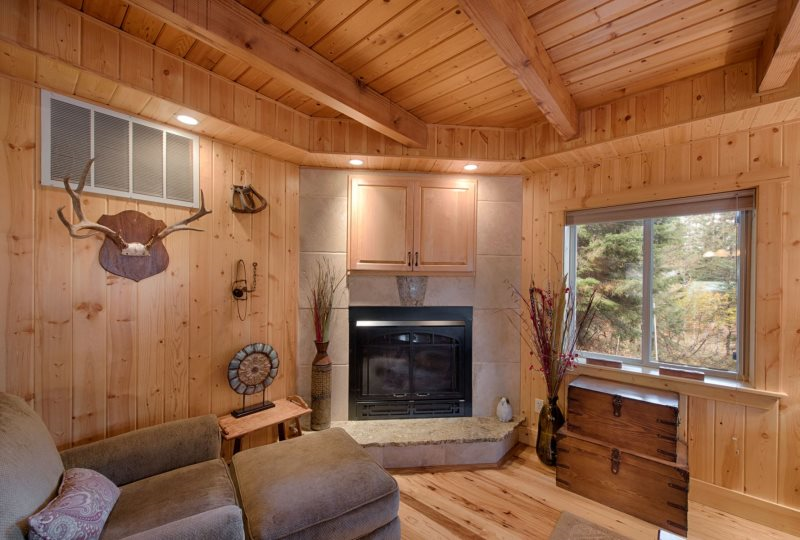 A propane fireplace with roomy slate hearth keep you warm during a chilly summer night and throughout the winter. 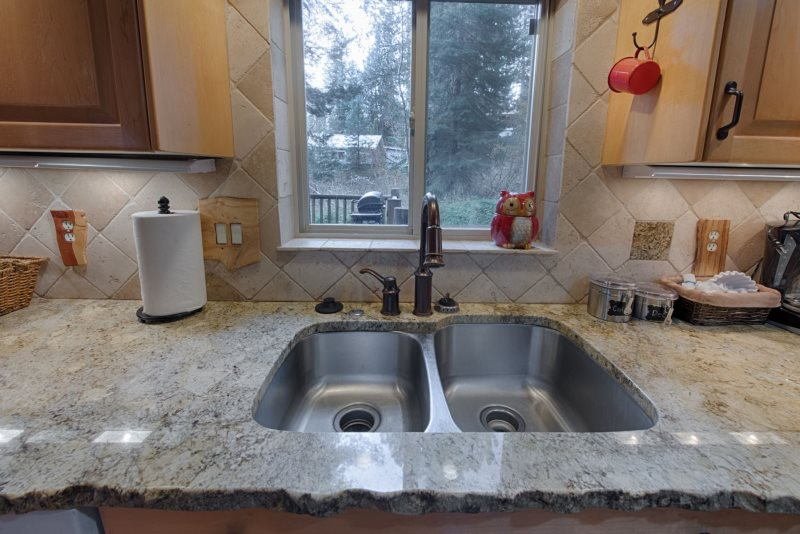 A compact and efficiently designed kitchen has granite work island and counter seating so you can keep the cook company. 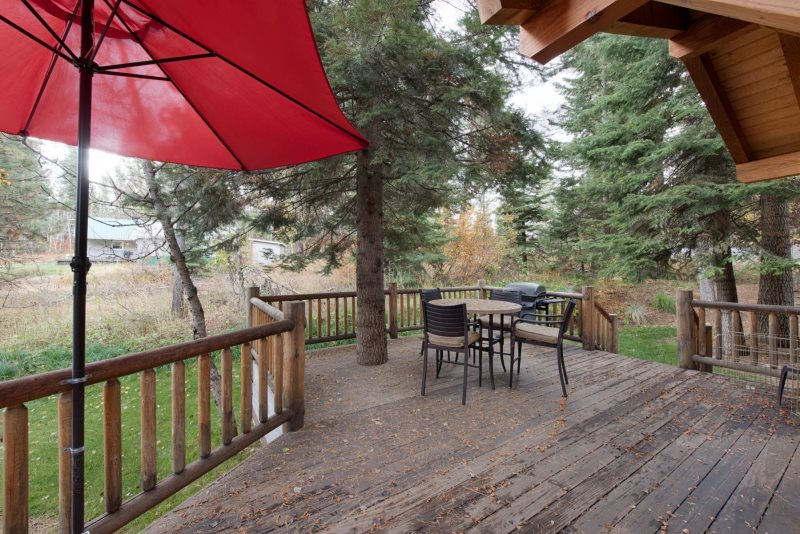 Get your grill master on and step outside to enjoy dining al fresco. 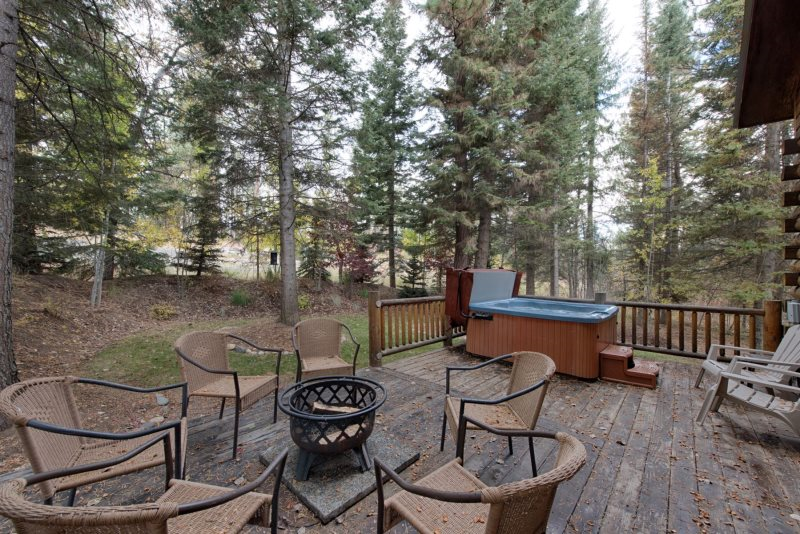 Expansive decking on the east, south and west sides with main level deck access from the dining room and hallway. 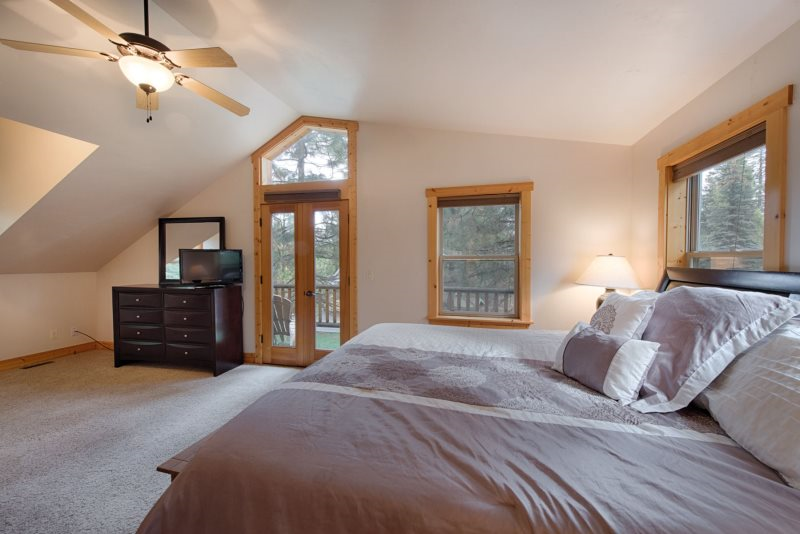 The upstairs Master Suite has private deck and balcony access. 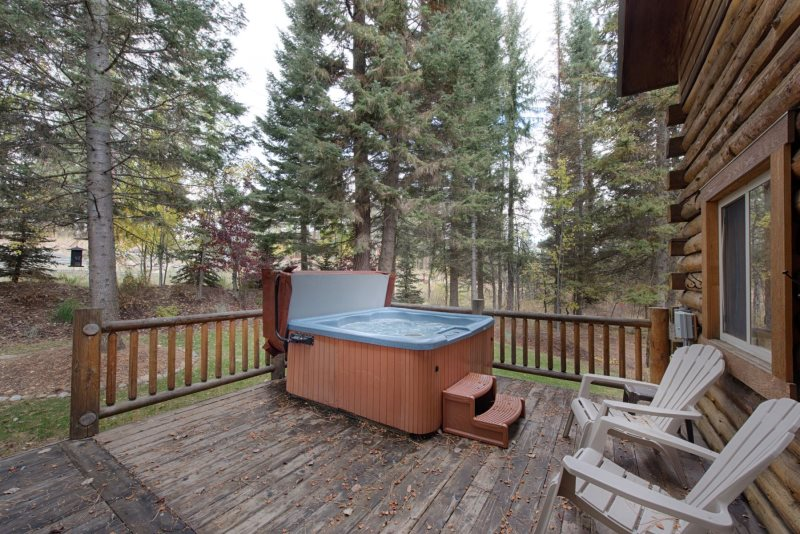 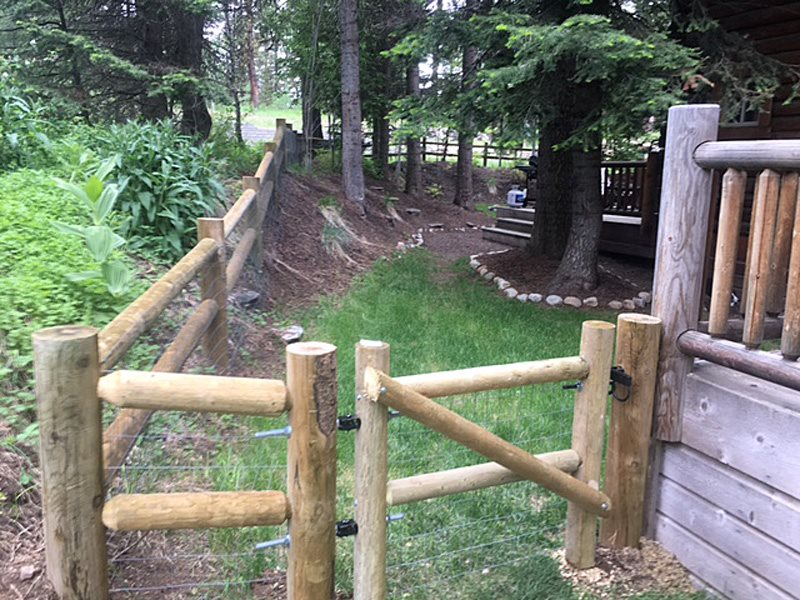 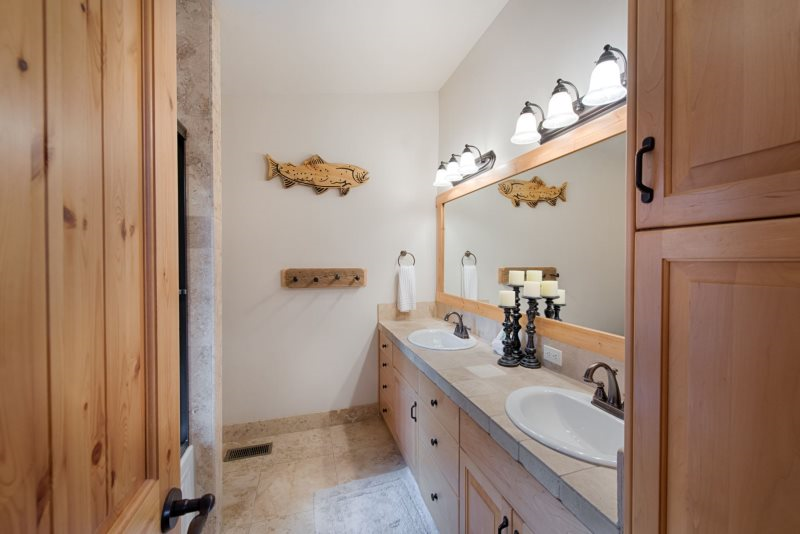 Gas grill and raised fire pit are out back for entertaining and a large hot tub for soothing sore muscles after you’ve spent a day exploring nearby Payette Lake, Payette National Forest or our favorite local gem, Ponderosa State Park. 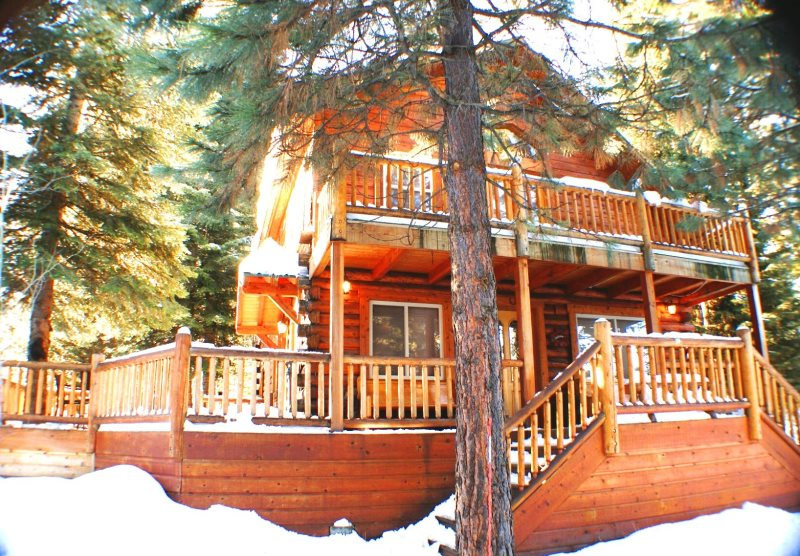 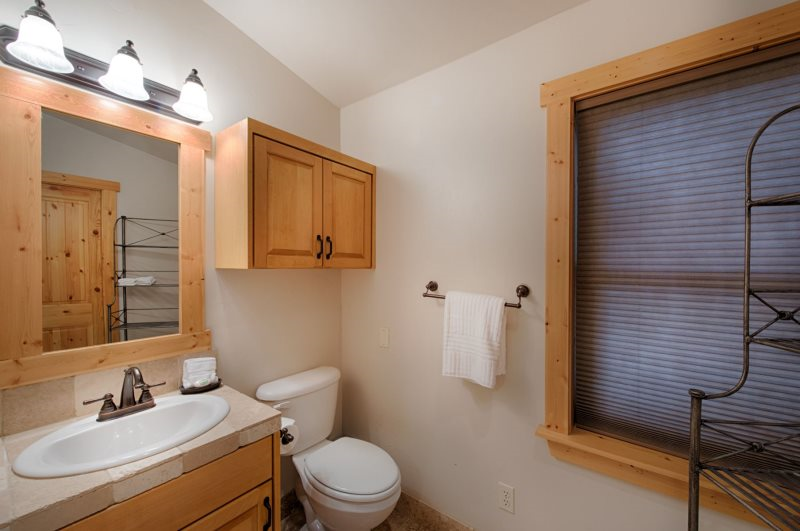 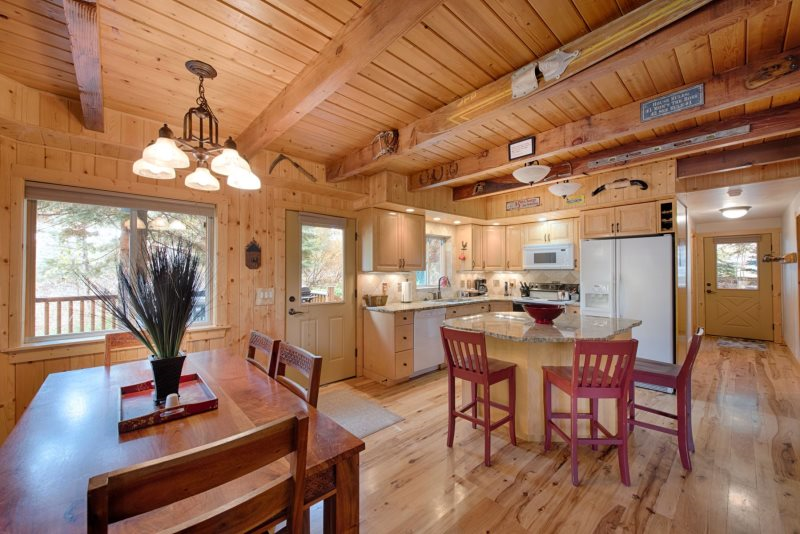 The Knotty Pine accommodates up to 9 people comfortably in 3 bedrooms and 3 bathrooms. 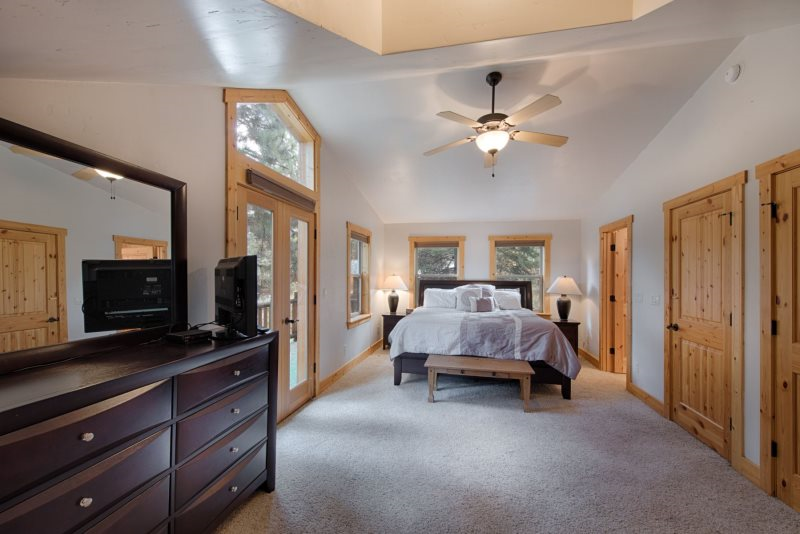 Main level accommodations include a guest bedroom with Queen bed and hall access bathroom with shower. 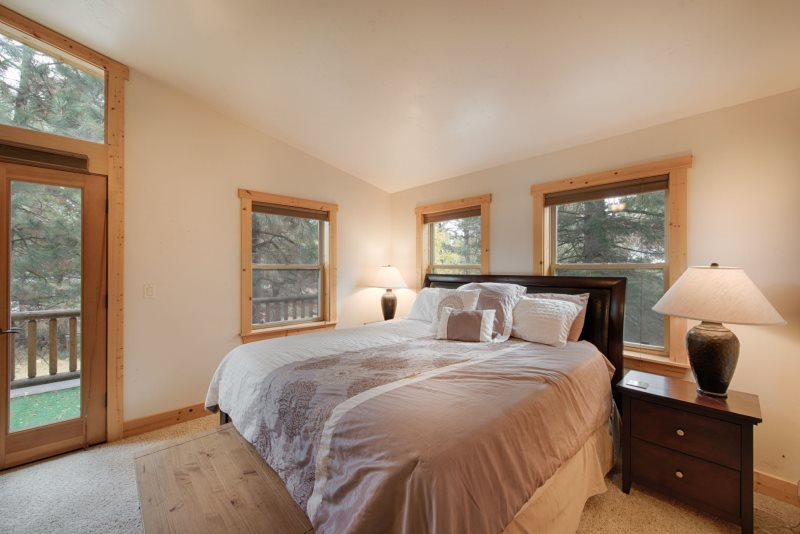 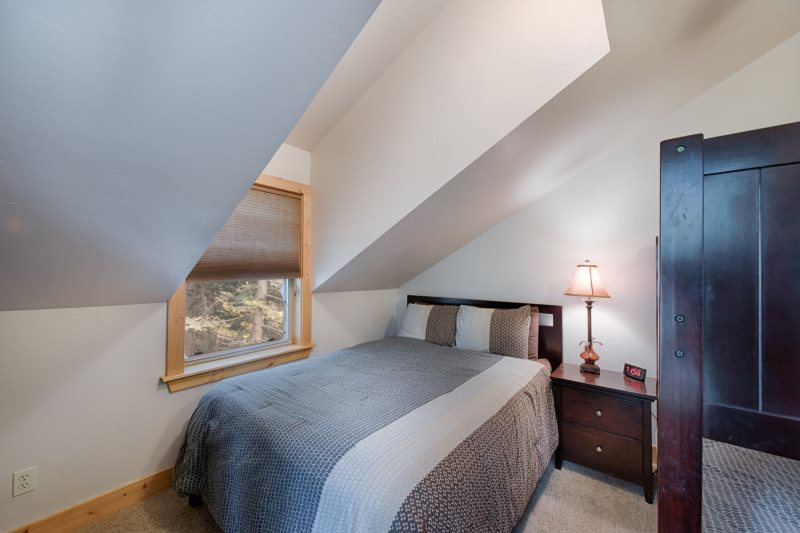 Upstairs you’ll find the Master bedroom with King bed and a full size attached bath with twin sinks and sitting area. 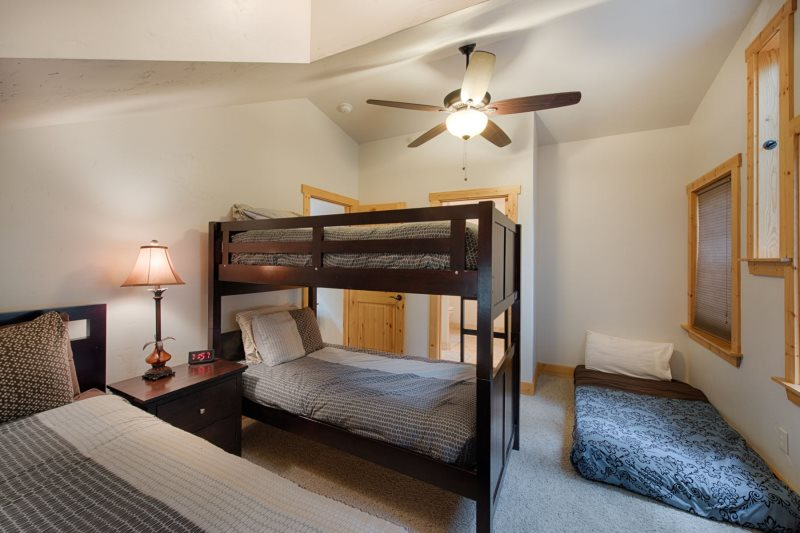 The third bedroom is located upstairs and has a queen sized bed and adult twin over twin bunk set that includes a trundle. 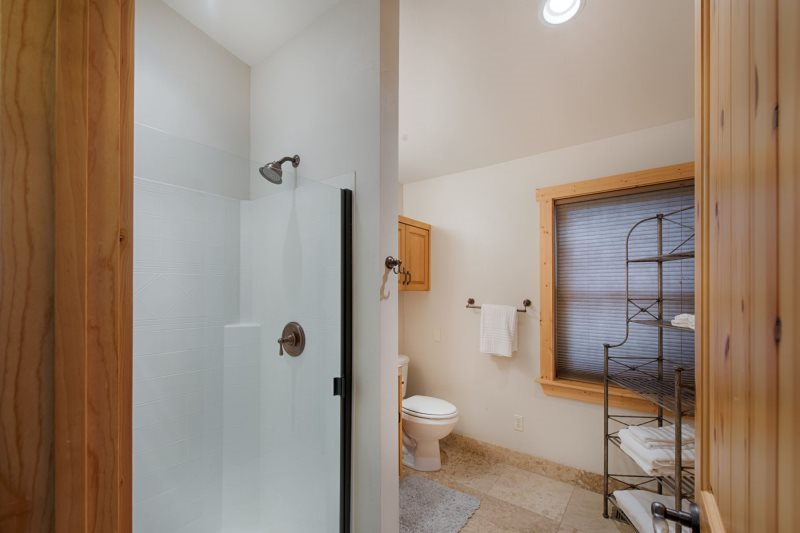 An additional, full size guest bathroom with marble tile accents, has both a shower and tub and is located across the hallway. 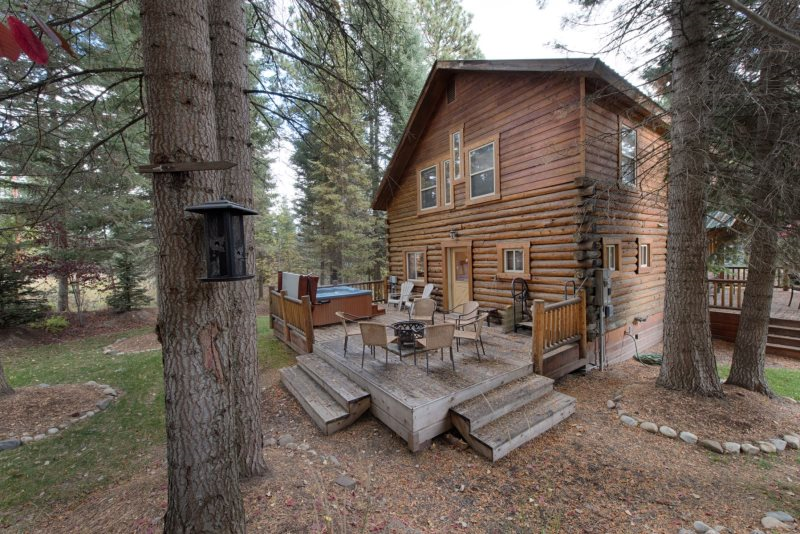 Pine trees and an established yard surround this log home with circular drive for easy access any time of year. 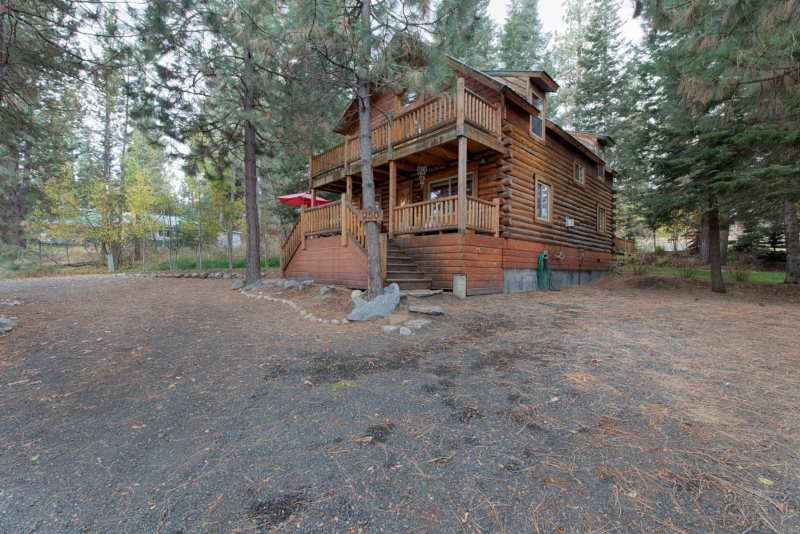 Driveway accommodates cars and trucks and a sled deck or trailer for your toys. 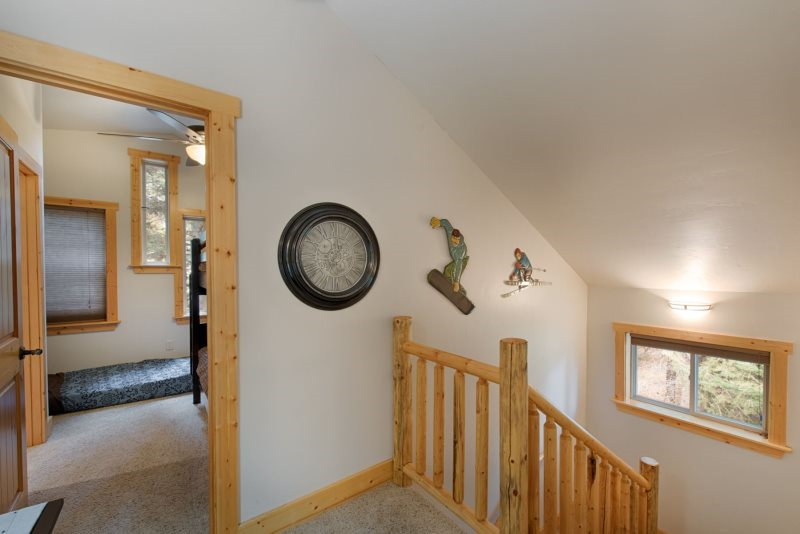 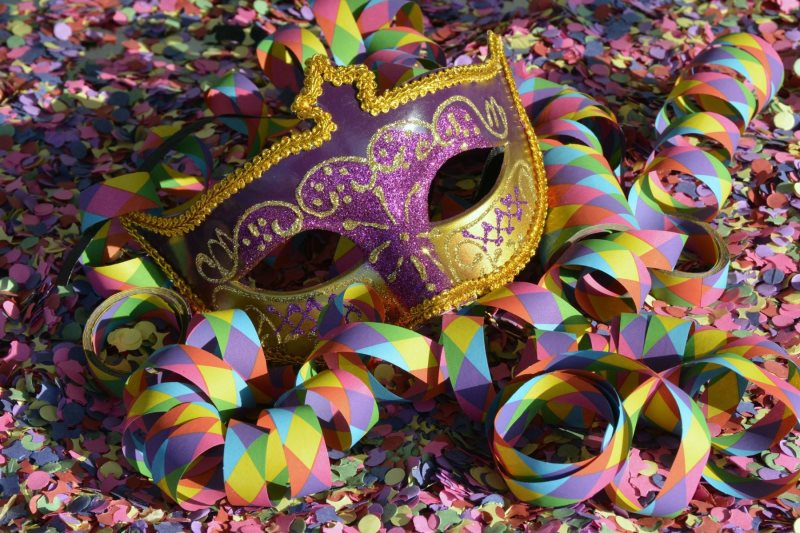 A great Winter Carnival home base – you're just a few minutes from Downtown shopping, dining, recreation and about 1/2 mile from the lakeside, Rotary Park. 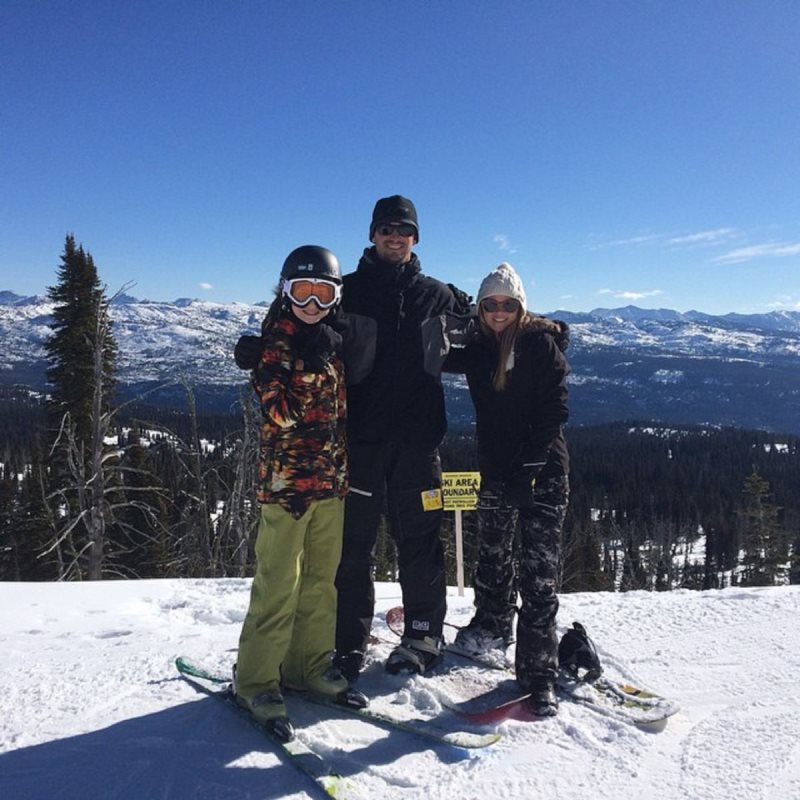 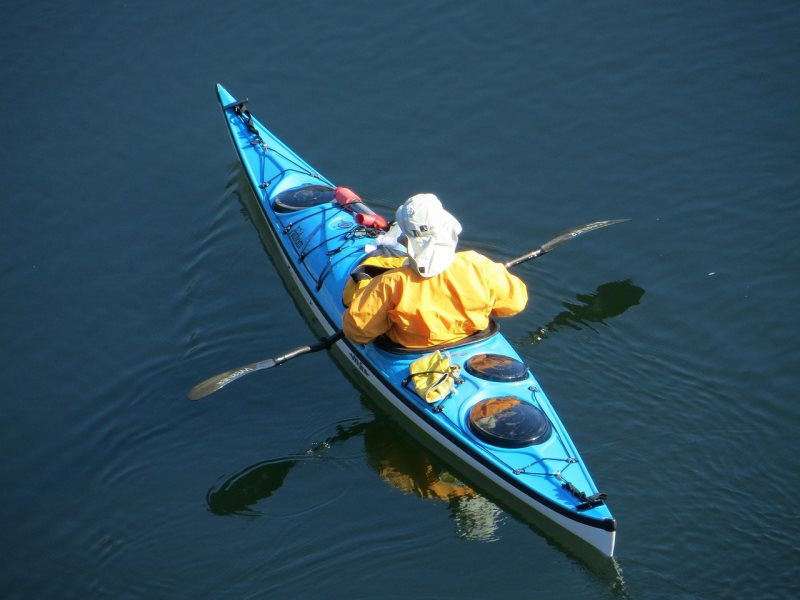 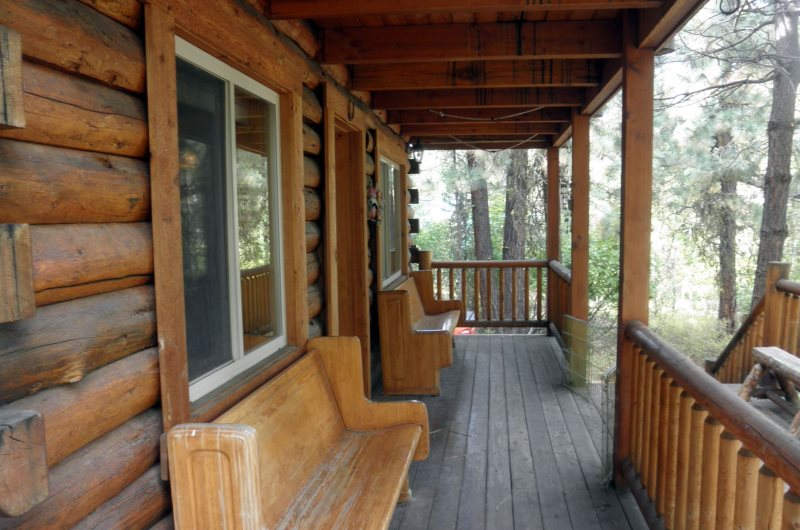 Start making those special McCall memories now at The Knotty Pine!